Another Long Walk: Happy New Year! of trail was ugly clear cut. Just to celebrate the new year, I'm giving you a double feature--two trail days in a single post! Yeah, okay, I'm combining the next two days mostly because there's so little to write about. August 27: I woke up to a beautiful sunrise, but couldn't enjoy it much through the thick canopy. The hiking was mundane, with steep climbs and drops--an annoying change from the relatively flat hiking of Oregon. This first part of Washington certainly isn't an agreeable welcome. 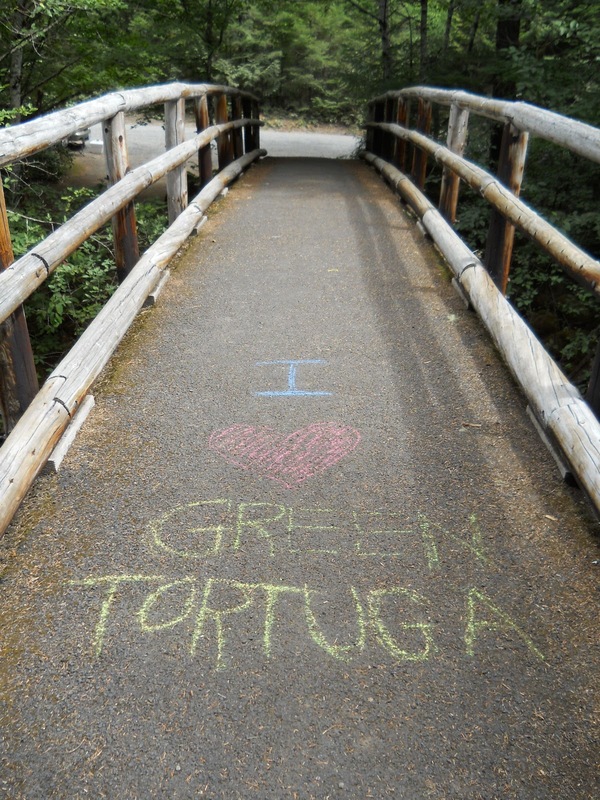 In the afternoon, I reached Trout Creek, crossing over a bridge with "I ♥ Green Tortuga" written in chalk. Amanda! And just on the other side of the bridge was Amanda sitting outside of her car ready with trail magic for any passing hikers and to meet me. 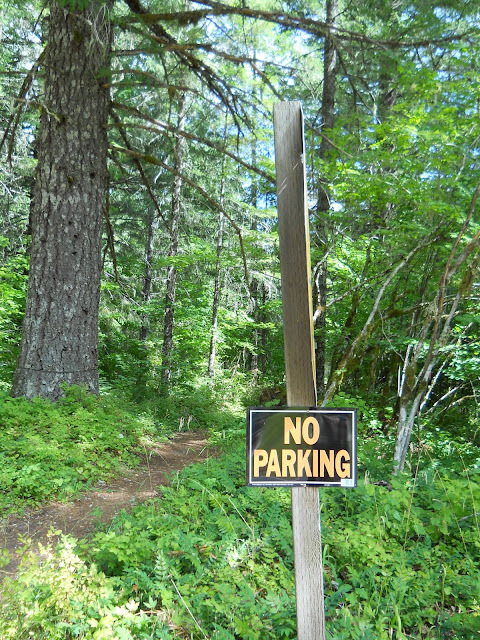 No hikers had passed by, not yet, at least, but I was happy to help myself to some of the trail magic myself. I'd only hiked 18 miles so far today, though, and decided to get in a few more miles before calling it quits. I told her that I wasn't aware of anyone close behind me and that she probably would not have any trail magicing opportunities. 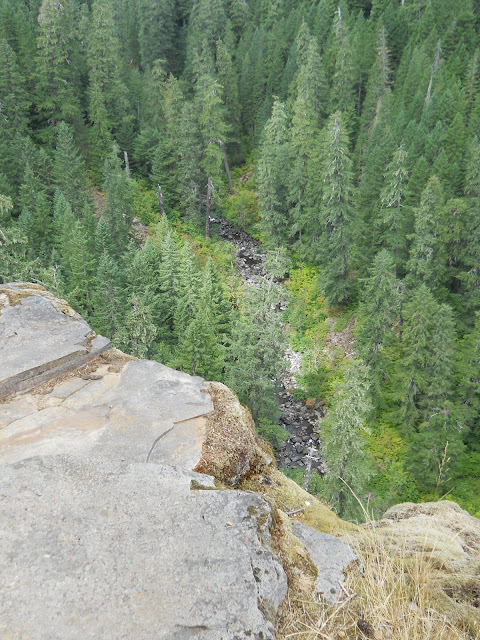 She told me that she saw one thru-hiker crossing on Bridge of Gods, who looked positively scared to death clutching at the railing like his life depended on it. She didn't recognize who it was, though, but at least I knew there was one hiker a day behind me. decades ago and is still growing back. I gave Amanda my pack and switched it out for a smaller day pack, then slackpacked another three miles to Road 54 (Little Soda Springs Road). Signs had been erected saying that no parking was allowed, and Amanda wrote in chalk on the road that she'll check back to pick me up since she wasn't allowed to park nearby. 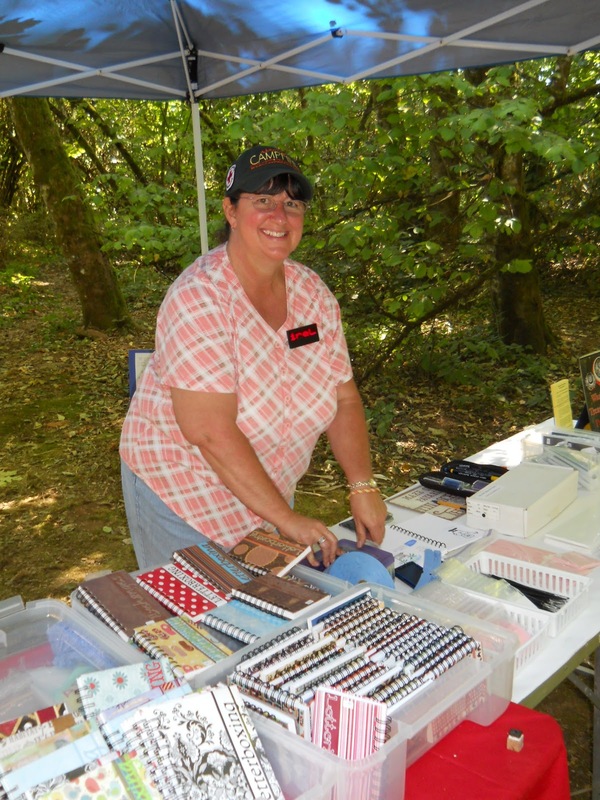 August 28: When I called Amanda from Cascade Locks to figure out exactly where we would meet up on the trail, she told me that there was a letterboxing gathering--a large one--happening in Battle Ground that Saturday, just north of Portland. Actually, it was a weekend-long event, and Amanda asked if I'd be interested in going. I didn't even have to think before I blurted out, "Absolutely!" 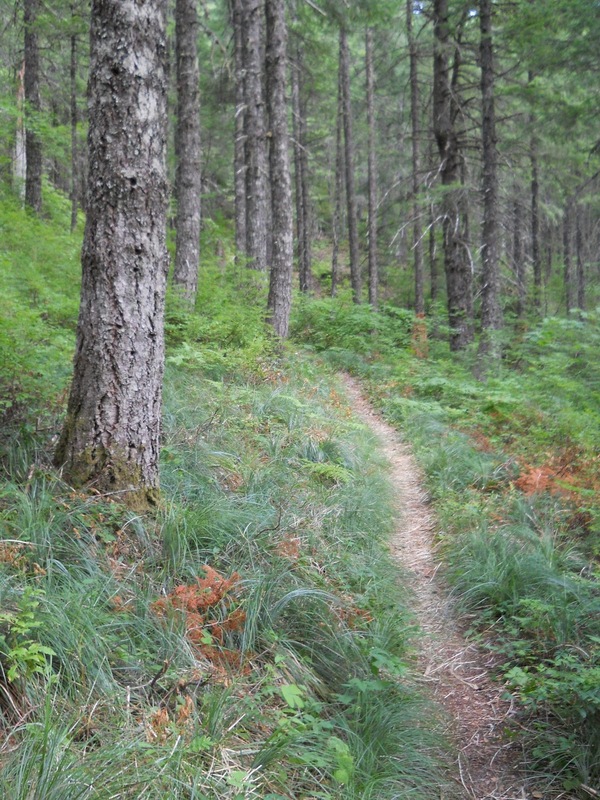 It would be wonderful to get off the trail for a day--my first zero day since California. 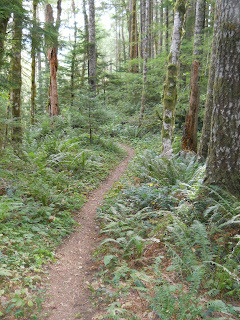 A change of atmosphere would be awesome, and Battle Ground was practically right around the corner from where I was on the trail. 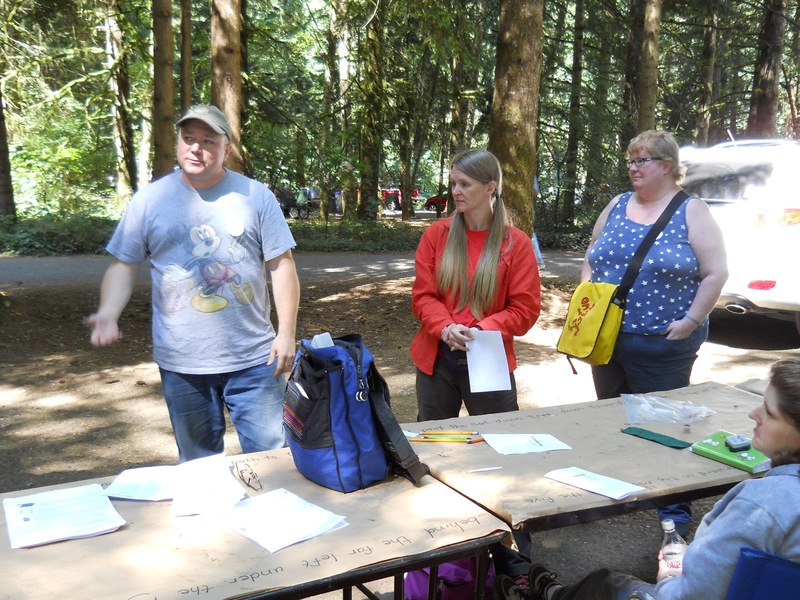 So we woke up that morning and headed to Battle Ground where we spent the afternoon with letterboxers--a decidedly strange group of people, but who smelled considerably better than the thru-hikers I usually hung out with. =) I think most people were surprised to see me show up, thinking that I was still on the trail. 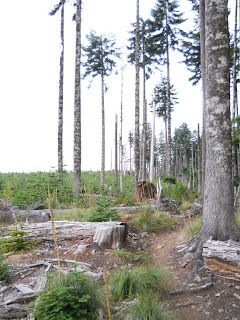 Well, I was still hiking, but most people didn't realize that I was nearby since by blog by then was so far out of date. 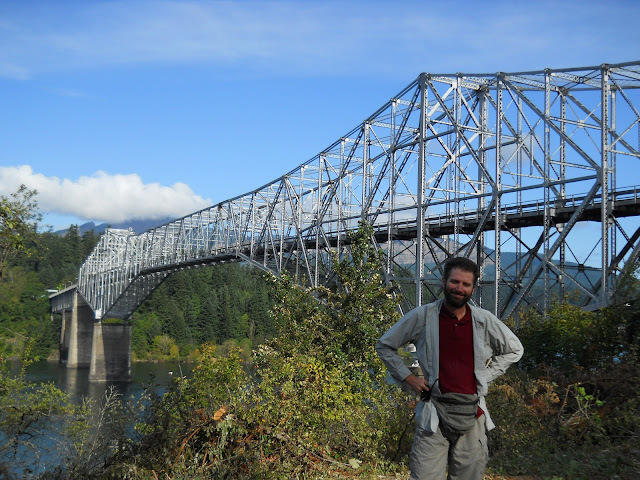 I was still hiking through the Sierra snowpack on my blog when I arrived in Washington. Amanda and I came back through Cascade Locks on our way to the letterboxing gathering. Here I get a photo of me with the Bridge of the Gods in the background. 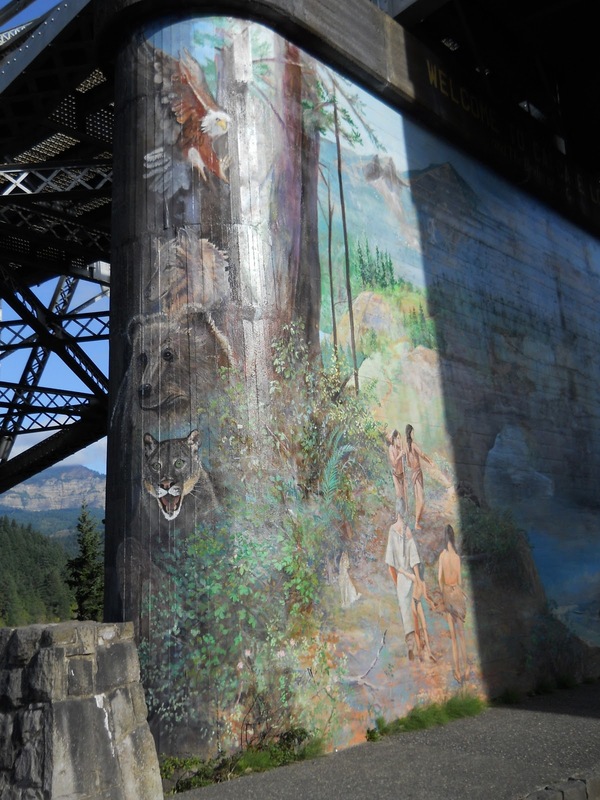 A closeup of the mural under the Bridge of the Gods. Happy SAHD gives a presentation on letterboxing etiquette. Wow! What an honor to be featured in your blog Ryan! I was pretty surprised to see you at my gathering and it was nice to have you and Amanda there. I wasn't surprised to see you, though I was glad both of you came. I had been reading Amanda's blog and knew you were near. In fact, I had thought way back of trying to have an event for you at Cascade Locks. But as you got close to the border, I knew I'd be busy at the Campout. 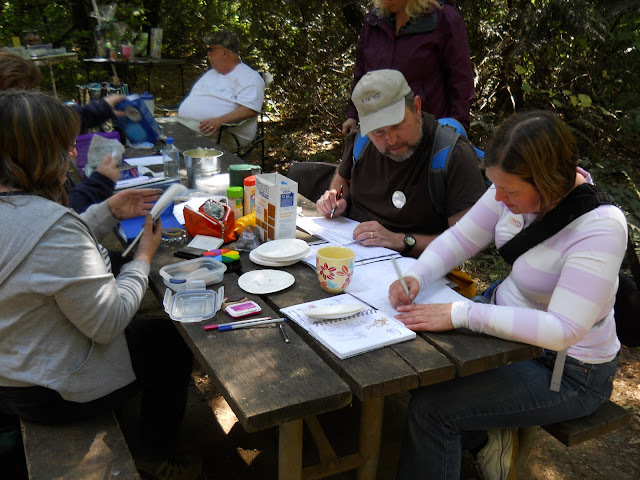 So it was so fun to have you there and attend my cipher workshop! You looked skinny and bearded and still was shuddering about the snow (I don't blame you). Oooh! The letterboxing journals look beautiful and I am needing a new one soon. I wonder if Camp Fire Lady has a website..hmmmm.